The Islanders made it 10 wins in a row with a victory over the Slough Jets on Saturday. Slough had been struggling with form coming into the game and were unsurprisingly considered heavy underdogs. From the drop of the first puck this seemed evident as the Isles controlled the pace of the game. The Jets kept up strong pressure on the puck throughout the period, but picked up a holding penalty early on and allowed the Isles power play a chance to line up. It took just 11 seconds for Nathan Pollard to capitalise on the opportunity and return the Jets to five skaters. This made little difference as, 36 seconds later, Pollard netted his second of the night. The rest of the period continued with an onslaught of Islanders pressure. Pentecost found Johnston out of position and slotted the puck into the corner for the Isles third goal and his third point of the night. Shaun Yardley and Conor Pollard also picked up two assists a piece for their efforts. The Islanders started the second period 3-0 up and found themselves once again struggling to keep the same pace up. In contrast to the first period, the game slowed down and complacency set in. The Isles registered just 12 shots - less than half their first period tally. 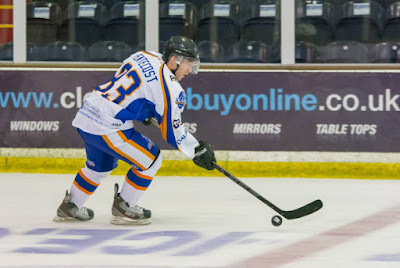 Fortunately, Dale Jowett was able raise sprits when he chalked up his first goal of the year, courtesy of an assist from Connor Stokes, a favour Jowett was able to return in the third period. The Isles had a chance to make it 5-0 just 5 minutes later, but had the goal waved off by referee Will Hewitt who blew the whistle quickly after he lost site of the puck. Unfortunately for the Islanders, the puck was still uncovered just an inch off the line. They swept it in, but just a split second too late. This confusion caused some Islanders heads to go and they lost all shape. The Jets Rob Johnston found himself free in front of an empty net as the puck bobbled free and he took the chance to ruin what would have otherwise been a clean sheet for Dan Lane. With the second period tied at 1-1 the Islanders had a point to prove in the third. They upped their game once more and added three more goals to the scoreline. Stokes finished off Jowett’s set up, Cleves and N.Pollard linked up to find Yardley back door on the power play and Bavin combined with line mates Stokes and Jowett to close off the the scoring for the evening. The 7-1 victory keeps the streak alive for the Islanders, but they will have to work on maintaining consistency throughout to challenge for the league title. Rivals Chelmsford also won at the weekend, but seem a bit off their game after very narrowly pulling off a come from behind victory over the London Racers. If the Islanders keep their foot on the pedal it should be a very exciting end to the season when the two face off twice in March.